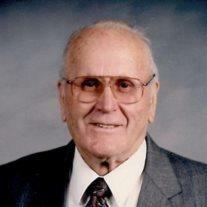 William “Paul” Smith, born May 24, 1917, was called home at the age of 96 on Friday, March 28, 2014. He was preceded in death by his first wife, Dorothy Annie Bolton Smith. Paul was born in Cardston, Alberta, Canada and lived his early years on the family farm in Hillspring, Alberta, Canada. He has 10 siblings; all but three (Ellen Bunting, John Smith, Ruth Gifford) are enjoying a wonderful reunion on the other side. He served a mission in the Northwestern States Mission and was sealed to Dorothy in the Salt Lake LDS Temple in 1948. He and Dorothy raised their 2 children, Brad and Sarah in Tarzana, CA. After Dorothy’s passing in 1986, Paul was sealed to Melba Woolf Smith in the Mesa, AZ Temple in 1990. He is survived by his second wife, Melba Woolf Smith, their combined 9 children, 47grandchildren, 42 great-grandchildren and 6 great-great-grandchildren. He loved life and loved people. His favorite pastimes were knitting hats, afghan blankets, reading and working in the Mesa LDS Temple. Funeral Services will be held at the LDS Chapel at 15 W. 1st Ave. Mesa, AZ on Thursday April 3, 2014 at 11 AM, preceded by a viewing at 10 AM.